The casual elegance of the Southwest is played out in stucco and tile with dramatic arched entrance and large windows in this exciting, open plan. A fireplace and built-in cabinets accent the large great room with cathedral ceiling. Open to the great room is a smart island kitchen with skylit breakfast area. The master suite is a private oasis with skylit bath and access to the rear deck. Cathedral and tray ceilings plus nine-foot ceilings throughout the home add dramatic vertical proportion. 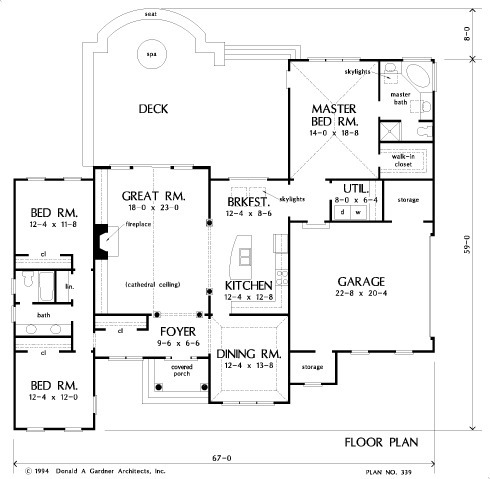 1st Floor: 2090 Sq. 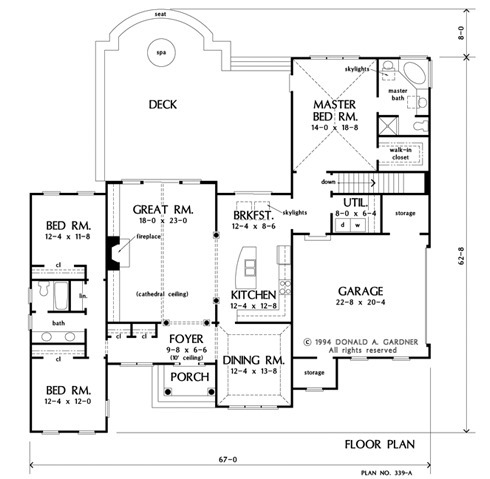 Ft.
House Dimensions: 67' 0" x 59' 0"
Great Room: 18' 0" x 23' 0"
Foyer (Vaulted): 9' 6" x 6' 9" x 10' 0"
Dining Room (Tray): 12' 4" x 13' 8" x 10' 8"
Great Room (Cathedral): 18' 0" x 23' 0" x 15' 6"
Kitchen : 12' 4" x 12' 8" x 9' 0"
Breakfast Room : 12' 4" x 8' 6" x 9' 0"
Utility Room : 8' 0" x 6' 4" x 9' 0"
Garage : 22' 8" x 20' 4" x 0' 0"
Garage Storage : 7' 2" x 4' 10" x 0' 0"
Master Bedroom (Cathedral): 14' 0" x 18' 8" x 13' 10"
Porch - Front : 8' 6" x 5' 1" x 0' 0"
Deck / Patio : 20' 4" x 25' 0" x 0' 0"
Storage (Other) : 7' 8" x 6' 4" x 0' 0"